A baby was born 13 weeks premature, becoming the smallest baby ever born at Nassau University Medical Center. Surrounded for months by love and dedicated care of the hospital staff, the little girl has now become a miracle baby. Stacey Bell reports. If you ask the staff at Nassau University Medical Center, little Hannah Bella Rodriguez is a miracle baby. The little bundle of joy is the smallest baby born at the hospital. Little Hannah was delivered prematurely via an emergency C-section, weighing in at just 530 grams, no larger than an adult hand. 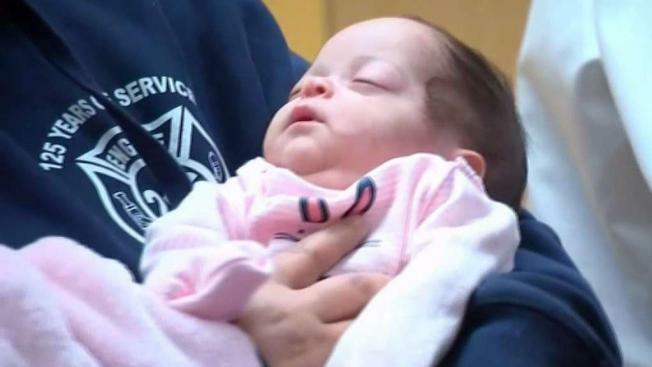 From July until October, baby Hannah and her mother Jennifer Pena were surrounded with the dedicated care of medical personnel at NUMC in Long Island — a hospital that doesn’t normally handle cases like this one. “Let’s not forget that NUMC is a safety net hospital, but they have the smarts, they have the capacity, they’ve got the staff to work miracles,” Nassau County Executive Laura Curran said during a press conference to officially discharge the little girl. “This is really, really an accomplishment. We couldn’t have done this without the really experienced OBGYN staff,” Dr. John Riggs, chairman of the OBGYN department, said, adding that it was because of the staff’s experience and knowledge that baby was able to pull through. Pena’s due date was Oct. 5, but Hannah was born in July — 13 weeks premature. However, now, after three months at the hospital, mom and baby are finally home. Pena is forever grateful for the caring staff at Nassau University, saying that the day she went into emergency surgery due to Hannah’s decreasing heartbeats, the staff was by her side. “I was so scared but they helped me a lot. I was crying a lot in the surgery room but they held my hand and said everything is for your baby,” Pena remembers, adding that she is “in love” with baby, but also loves the staff that has become family after spending months at the hospital. “She doesn’t let me sleep at night, but it doesn’t matter,” Pena says with a smile, all while staring at her firstborn: a miracle baby.